neat, but what is the point? Wait… Aluminum is diamagnetic (pretty much impermeable to magnetic fields), right? Therefore the aluminum arrows would do absolutely nothing? Or am I just on crack/way out of line? Still conducts electricity :) Antennas are made out of aluminum for the strength and light weight. Pretty sure you’re out of line. Most antennas use the electro part of electromagnetic waves, so aluminum should be fine. Also, it’s not that aluminum is impermeable to magnetic fields, it’s that magnetic fields don’t interact with the metal much. It’s an important distinction – if it was impermeable, you could use it to shield electronics from magnetic fields. I think it’s a bit narrow to saw that this is “AARL stuff”. Most amateur operators I know today aren’t members, and have a bad taste regarding the AARL… Though I do agree, getting more people involved in amateur radio would be awesome. That being said, the arrow shaft idea has been used for quite a while. In fact, Arrow Antennas (the guys I believe came up with the idea) sell many different versions of these for a very reasonable price. At first I was going to build one, but the parts cost almost as much as the antennas they sell, and their antennas are regarded as very good build quality. “Wait… Aluminum is diamagnetic (pretty much impermeable to magnetic fields), right? Therefore the aluminum arrows would do absolutely nothing? Waffle you’re thinking correctly, it’s permeability (ability to form magnetic field in response to magnetic field). Aluminum is about the same as open air. But for a radio antenna this property doesn’t matter, conductivity is what you’re after. He needs to get some gold arrows! is this for the iphone? The ARRL used to serve a very important role in the world of ham radio. But now, like many things from years past, it has been replaced by the internet. Arrow Antennas have been around for ages, as someham mentioned. The dual band antennas are great because they make it easy to work dual band satellites, and a simple twist of the wrist corrects for (always changing for some sats) polarization. This type of antenna is great for fox hunts, although some prefer a tape measure antenna (you don’t break it when you hit it on a tree or car door frame). SWR is important, but it isn’t so much a measure of an antenna’s performance as it is it’s electrical match to the radio. SWR basically measures the amount of power reflected back to the radio from the antenna due to an electrical mismatch. It depends, mostly, on the capacitance and resistance of the antenna (which is in turn based on the frequency of the signal). Its black magic to me, but smith charts (wasn’t there a post about them awhile back?) can be used to describe the radiation pattern of a given antenna. You can actually calculate the angle the RF leaves the antenna. An example: a 2m J-Pole antenna can be tuned to the 70cm band (in other words it can have an SWR approaching 1:1), but the angle of attack (radiation pattern) of such an antenna is so bad that it makes the antenna almost useless at those frequencies. Aluminum arrow shafts like this one and the ones from Arrow antenna are great. They are made from 7076 aluminum, which works a little like glass – you nick it with a file and snap it off. It is also stiff, as opposed to 6065 hobby tubing, which is just bends every which way. does it work with the iPhone 4? Who cares about analog signal anymore, digital is the future. Unless you building cool wireless antennas don’t post crap like this. Actually, you can use this for “digital signals”, which is actually analog radio waves modulated with digital bits of information. People are using D-STAR into AO-27 to relay their “digital signals”. The ISS also serves as an APRS repeater which is a “digital signal”. Using the arrow shafts was a brilliant hack. That totally rocks. They are cheap, light, tough, highly conductive, easily sourced, and already internally threaded. Yes materials choices were really well made. Love antennas and radio hacks! Last I checked, you can push digital signals wirelessly… including satellites as mentioned in the article. Besides, Yagis (coupled with very simple circuits) can be useful in locating RFI sources. Bring more of ANY hack – the wider the focus, the better chances of learning more and mixing-and-matching dissimilar fields into something new. Sometimes I wonder if antenna acronyms actually mean anything, or if radio enthusiasts just really like to make you go “What?” whenever they come up with an antenna name. But nice work with using arrows. Aluminum is actually one of the more conductive metals so you should get less signal loss than using a different metal, and the arrows are cheap as heck. Yagi-Uda isn’t an acronym, they (Yagi and Uda) were two Japanese dudes who invented this particular type of antenna. @norg is probably a troll who thinks you need a ‘Digital T.V. Antenna’ to receive digital broadcast television channels. If you don’t like this kind of stuff don’t read it, maybe this site is more your speed http://www.hamsexy.com/ All harshness aside, I challenge you to study and pass your technician exam and get into amateur radio. Aside from communicating locally and around the world on lots of different bands (frequency ranges), in different modes, all on one radio (or more), there is much more than you could ever imagine to be learned in this hobby. BTW “cool wireless antennas” umm, all antennas either transmit or receive a wireless signal. I like this article. I am planning on building a yagi for 2m and this looks to be the way I might go. 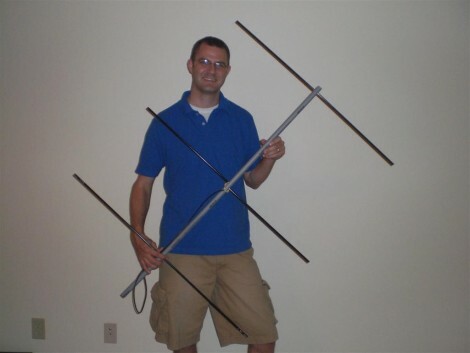 I recently completed a “backpack yagi”, linked from the article – VERY cool. I want to add 70cm coverage to it. I’m currently working on adding 70cm coverage to the arrow yagi antenna as well as a homebrew diplexer. Stay tuned for that – Check my site over the next week or so. Because nowadays being a douche is replacing civil and constructive commentary on HAD. That said, I applaud any and all attempts at civil discourse and re-iterate that THIS STUFF IS SO COOL!!!!! Are there any mode B (70cm up/2m downlink) amateur satellites in operation today? I remember many wonderful QSOs via Amsat Oscar 13 back in the 90s, but I guess those days are gone forever. there is no such thing as digital signal, what you might call “digital” is analog signal modulated in specific way. @Daniel confuses a Smith Chart, which is a plot of impedance against frequency (from which you can derive VSWR), with a Polar Plot which shows the directivity of an antenna. Look similar, but very different. Element conductivity is not nearly as important as the BALUN method used to transform the coax feed to/from the Driven Elements. Yagi’s are great gain antennas for the home builder, I built a 2 meter, 5 element beam out of old TV antennas that I harvested for parts, and the SWR only goes from 1.2 to 1.4 across the band, not too shabby for free. I’m in a remote area, so now I’m gathering old TV antennas for the parts to build a 22 element 2 meter beam for our weekly simplex net (repeaters … who needs em). I made a some yagis a few months ago, but being cheap I wanted the lowest cost – PVC pipe for beam and ‘hanger wire’ (the stuff used for hanging suspended ceilings @ $0.60 for a 4 foot length). Driven element was a folded dipole (apparently) sized to give 50ohm impedance, worked well enough to hear some amatuer satellites. Making a jig to drill holes in PVC ensured that they were all on the same plain. Hi!need help in building a yagi uda Ant for a given assignment. Can someone guide here in building a 750Mhz operating Ant. with Beamwidth of around 90-120 degrees where elements are horizontally polarized. Thanks for all the compliments for tis site.